Susan Frontczak plays as “Frankenstein” author Mary Shelly during a previous Chautauqua performance in Gallipolis. She will return as Erma Bombeck this evening. GALLIPOLIS — Ohio Humanities’ Ohio Chautauqua makes it second stop of its 2018 tour in Gallipolis and begins its performances Tuesday (this evening) in Gallipolis City Park with live music starting at 6:30 p.m. and a performance by Susan Frontczak as Erma Bombeck at 7:30 p.m. Performances are free and open to the public. Chautauqua prides itself on “living history” and its performing scholars answer questions and enact the life of their chosen personas. Frontczak previously appeared in City Park in 2016 as the author of Frankenstein Mary Shelley and physicist Marie Curie, often credited with discovering radioactivity. Each evening, as live music fills the air, community members meet under the tent prior to an Ohio Humanities scholar taking the stage to bring an historic figure to life. Each evening has a different living‐history presentation. These performances will be centered in Gallipolis City Park. Each history scholar encompasses their character’s speech, mannerisms, clothing, published reflections, struggles and victories. Frequently, scholars bring items of the period that the character would have used. Each scholar uses any or all combinations of these elements to create compelling performances. Afterward, attendees will have the opportunity to step further back in time by interacting with the historic character with a question‐and‐answer segment limited to the historic character’s respective lifetime. It is then followed by another question‐and‐answer segment with the scholar themselves about the character’s impact on the natural world and what is known about them since their death. Fred Blanco will appear as labor and civil rights activist Cesar Chavez Wednesday night, again at 7:30 p.m. with music starting at 6:30 p.m. in City Park. 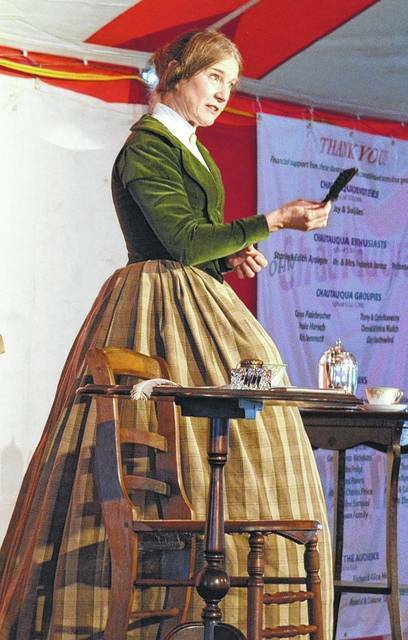 https://www.mydailysentinel.com/wp-content/uploads/sites/14/2018/06/web1_DSC_0423.jpgSusan Frontczak plays as “Frankenstein” author Mary Shelly during a previous Chautauqua performance in Gallipolis. She will return as Erma Bombeck this evening.